Wreck-It Ralph came just as Disney was giving its little brother Pixar some serious competition. With films such as Tangled, Frozen, and Zootopia, Ralph had all the necessary elements: heart, humor, and great looking animation, but it also had an original story with a previously untapped universe, that being retro video games. After the success of the first film it was inevitable that we would get a sequel in this epic world which is about to get even more huge as Ralph Breaks the Internet. It’s been six years since arcade game character Ralph (John C. Reilly) and his friend, glitch turned princess Vanellope (Sarah Silverman) saved their games and enjoy their newfound friendship. But now with the repetitive nature of her game life as well as her daily routine which she sees as not enough, Ralph sees it as the best of times. 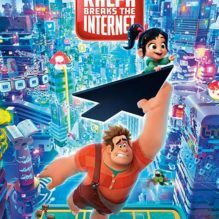 So when Vanellope’s game “Sugar Rush” gets damaged, Ralph comes up with a plan to use the arcade’s recently installed wifi to travel to the internet, specifically eBay in order to replace the damaged part. Along the way they discover the diversity of on-line gaming which excites Vanellope as she meets Shank (Gal Gadot) a tough racing queen from the game “Slaughter Race” with its ever-changing environment and challenges it’s exactly what Vanellope is looking for. But as Ralph is exposed to this new world he just wants to go home, and get things back to normal. It was exciting to see an animated film tackle the ever-growing world of video games. Even though the first Ralph focused more of its time on story and character with the gaming remaining in the background, the balance was enough to have you wanting more. Here with the sequel I was sure the filmmakers were going to double-down on the gaming culture and have our heroes on a fun adventure. But unfortunately like the first film they took a universe, that being the internet and kept it in the background which left little time to spend on character and story. They settle for broad strokes of that most double-edge of swords where the internet can make you a star and destroy you all for doing the exact same thing. There is also no real villain here other than Ralph’s insecurities which manifests themselves in kind of a creepy way, and I’m talking Clive Barker creepy, my 5 year old was a little disturbed by the finale. What does work and what should have seen more time than the internet gags was Gadot as Shank, who is charismatic and tremendous even as an animated character, and the “Oh My Disney!” website. All the rapid fire jokes done at the expense of the extended Disney worlds, like Marvel and Star Wars are really great and the Disney princesses would make a super fun short as they are the motley-ist of crew when put in the same room. Every laugh lands and it made me wish more time was spent there than the internet as a whole which lets be honest, it’s way too big to cover or really make coherent in a children’s cartoon. So while it lacks the heart and humor of the first Ralph it’s still a fun ride with amazing visuals but with still more room to grow.